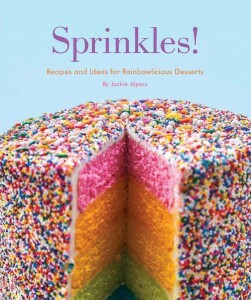 Next week Quirk Books is releasing my debut cookbook, Sprinkles! Recipes & Ideas for Rainbowlicious Desserts. It’s an adorable book that teaches you all about everyone’s favorite confectionary, and dishes out a number of recipes, projects, and even crafts that use these tasty little pieces of sugar. To celebrate, they’ve put together a fun Rainbow Sprinkles Blog Tour with a number of great bloggers. Starting next week and running through November, bloggers will be experimenting with Sprinkles, and sharing their color-/specific recipes. One week, we’ve got red. Another week, we’ve got orange. Then yellow, green, blue, purple… hitting all the colors of the sprinkles rainbow. At the end of the tour, we’ll roundup all the recipes and photos. However, we want you to be able to see the recipes as they go live! So check out the blogs participating below, and be sure to bookmark their sites, follow them on Twitter, etc. We’ll also be sharing their photos on our special Sprinkles Pinterest board. During their week, we’ll post their recipes to the board and share them with all of you! Tagged as: blog tour, cookbook, desserts, Sprinkles!